Have I ever shared my story, my passion, my love, and what I ACTUALLY do? Um, no...and that's slightly embarrassing. My lovely people of the internet, I am Sydney Marie Olsen Sherriff. I am a wife, mother, daughter, sister, friend, sunday school teacher, believer of God, enthusiast of everything that comes from the earth, and Certified Holistic Health Coach. It's crazy for me to say those words: Certified Holistic Health Coach. When I was 10 I wanted to be a 2nd grade teacher. When I was 14 I wanted to be a pediatrician. When I was 16 I wanted to be a mental health therapist like my mother. It wasn't until I was married that I realized who I TRULY am. Some people think my title immediately is given to me because of my association with doTERRA. NO! I worked long and very hard for my certification, and am so proud of the knowledge I have through my schooling. Many of you know that I have had my own health issues and struggles. But what really made me turn to holistic alternatives is my mother. My best friend for as long as I can remember was diagnosed with Multiple Sclerosis; a life threatening and deadly auto immune disease, when I was 12. She got so sick she couldn't bend over to pick up her socks, get out of bed because of her vertigo, feel her left foot, and the list goes on. I was one scared little girl who didn't know if her mother would make it to her wedding day, or see my children come into the world, or teach my little boy how to make snakes with Play-doh. But she did. Our doctor who diagnosed my mother with MS told her, "I can't do anything for your body. All I can do is treat your symptoms." With a grandmother that died after 7 years with the disease, my entire family knew this wasn't a good situation. Think about your mom for a second. To me, my three brothers, and father she was our rock, our spiritual light, and the arms we wanted to burry our face in when our world seemed to be crashing down on us. To think of loosing her wasn't just scary, it was absolutely heart wrenching. I remember writing in my journal one particularly hard afternoon, "So, I think my mom isn't going to live that much longer. I don't know what I'll do without her." That same afternoon an angel was sent to us. A good family friend knocked on our door and asked my mother if he could talk to her about Frankincense for her MS. Bless my mothers soul, she listened. What would've happened if she would've turned a prideful shoulder? I hope something else would've come along. But, you never know. 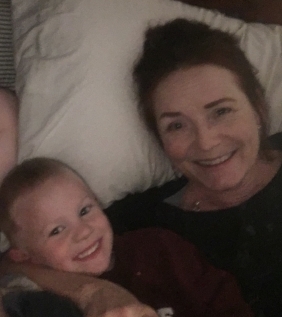 Now, she has memories with her grandchildren, snuggles with my Wild Bill, does yoga every morning, eats fermented veggies, teaches me how to parent my child without completely loosing it, buys chocolate bars for Wild Bill so he knows grandmas house is a "the place to be", and best of all....she's with us. Living her life with her 4 children, husband, and 2 grand babies I'm convinced she loves more than her own kids. Ha! All because of NATURAL MEDICINE. THIS is truly the beginning of my inner crunchy hippie. After the long hard years of trying and finding an answer to my mothers health and our family crisis I quickly realized my eyes had been opened up to a whole new world of medicine, and I was INTERESTED. From age 15 my mom brought essential oils into our home and eased stomach bugs, ear infections, headaches, my chronic fatigue, my dads arthritis, my aching softball catching knees, sliced fingers from cutting thanksgiving turkey, and SO MUCH MORE! I absolutely loved that we had a natural medicine cabinet in our home, and watching my mother be her own family doctor. I watched her, and learned so much. I wanted to be that for my future family! After I got married at the young age of 18-no I was not pregnant, I realized how much I learned from watching my mother take care of herself, and our family naturally. Because now I was doing it on my own and with my husband. Thank you, mom! Soon after getting married I heard of a school in the good ole city of New York that taught how to heal and support the body with food, herbs, and other natural practices! WHAT?! SIGN ME UP! I called the institution that day, and got enrolled! I learned SO much! Almost more than I could keep up with! I felt like I was in medical school...but hippie style. HA! I learned how anxiety and stress cause hormonal imbalances and eating disorders. I learned what it means to have an alkaline inner ecosystem to reverse inflammation, autoimmune diseases, and systemic yeast. I learned Ayurvedic medicine and practices! EVERYTHING I was learning I absorbed like a sponge. These professors, physicians, and naturopaths were speaking my language. Shortly before graduating I had my beautiful William Noah. Let's get rizzity real, people. I struggled. Actually I didn't just struggle, I was drowning in overwhelm and self doubt. Post partum anxiety is REAL. Sleep deprivation is REAL. Colic is REAL. Everything you're warned about pre natal is REAL. I realized I not only had support from my husband and family, but I had holistic knowledge and tools that could give me relief and support as well! I had Digestzen essential oil that could give my sweet 3 week old some gas relief, Wild Orange, Peppermint, and Lifelong Vitality that could help my chemical imbalances that was causing my anxiousness. I had Cypress and Lavender essential oil that unclogged my milk ducts which were causing mastitis. I had fermented veggies and super greens that lifted my energy enough to get me through the day. I had my healthy habits of being active, incorporating super foods into my diet, staying away of sugars and processed carbs to avoid yeast and candida, and drinking enough water in place BEFORE bringing Will into this world. Which set me up for success during that difficult first year! I'm not saying if you're not a certified health coach you'll be a crappy mother who struggles until the end of time. What I'm saying is learning natural alternatives and holistic practices to take care of your body will save you hours of trying to figure out what's wrong! I still struggled after going to the gym, eating nutrient rich foods, using essential oils, and prioritizing my life. But it brought my struggles of being unmanagable to "Okay, I got this." I do what I do because I've been there. I've been scared for my mothers life. I've cried myself to sleep because of self doubt. I've said many curse words because my new born was on his 7th night of not sleeping. I've laid on the restaurant bathroom floor because my stomach is in so much pain I can't even sit up due to digestive problems. I've BEEN THERE, MOMMAS! And damnit, I want to encourage, help, and teach other mothers how to give themselves and their family some help. Your health is important, your husbands health is important, your 2 year olds health is important! Millions of families don't know their are alternatives to the health and mental challenges they are facing. But there is! You can get through hard things on your own, but a little peppermint can definitely make it a little easier. :D HA! I hope this is a place of helpful information, occasional laughter, and complete upliftment for any and all who need it! Love you all!